Why Art Photography? does not ask if the photograph is worthy of the museum or academy—that battle has been fought elsewhere—nor does Lucy Soutter, the book’s author, rewrite the treatise on how the medium has fared in an art-after-representation, post-Conceptual world. * Soutter thinks photography is doing fine—photographers are using new technologies, modes of distribution, and cross-medium experimentation to make works that are fertile and expansive to the experience of art. She writes that “photography has never been one medium, but many,” (129) and this is to its credit. 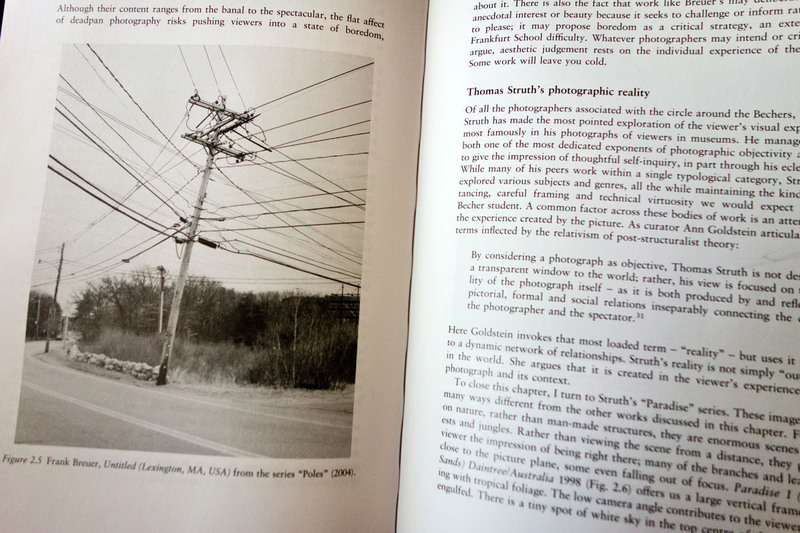 What Soutter urges for in this book is unadulterated critical thinking when it comes to art photography—pure and clear—an autonomous art-historical approach within academic and institutional discussions when what is being discussed can be so much more. Unarguably, I find this an interesting and legitimate cause. Soutter leads me to new avenues in thinking about thinking about art photography. Photography is an infinite pool from which to pull academic arguments and questions like Why Art Photography? 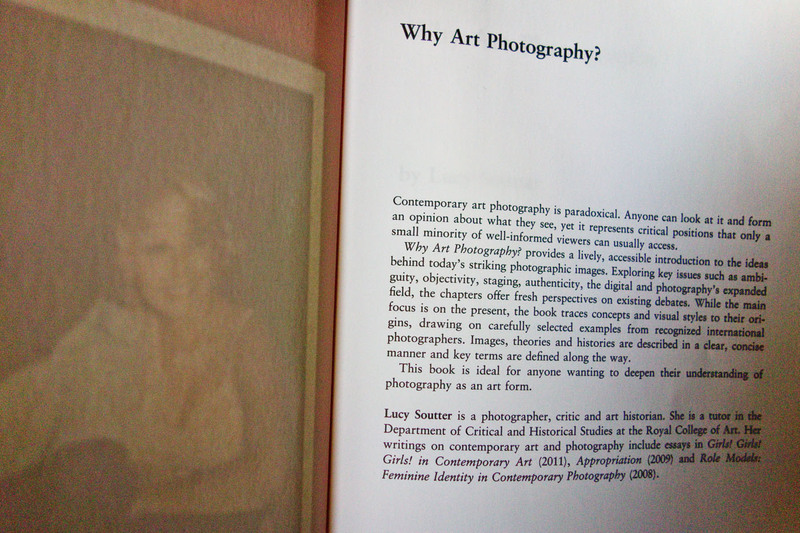 But despite Soutter’s positive outlook, Why Art Photography? is not an electrifying invitation to feast on the ever-expanding and stimulating possibilities for photography as art. Rather, Why Art Photography? is an explicit and mind-numbingly comprehensive checklist that lays down a barrage of academic prerequisites for making and apperceiving art photography. “The art world today assumes a fairly high level of academic training in artists as well as critics,” writes Soutter, (27) and “the ideas that circulate around art photography are both necessary for interpretation and yet frequently difficult to access.” (17) I feel a bit like I am getting tips on how to join a cult. Soutter makes her biases clear early on, in line with today’s academic circles: “photographs with a more formalist, modernist orientation tend to circulate in specialist photography galleries and fairs. The broader art world regards this photographic culture as somewhat insular and limited in outlook.” (6) Those poor souls who just had some “subjective, expressive urges” they wanted to pour out onto a damn sheet of photographic paper will find that these urges are “considered highly problematic within contemporary photographic education,” according to Soutter. And some hapless students have this to look forward to: “photography students on their individual journeys of discovery are often baffled as they hit the invisible postmodern barrier” (5)—these ones will have a hard row to hoe in the face of Soutter’s academy. Soutter wants a place for these considerations in discussions, regardless of photography’s fluidity as a medium, with uses that are just as applicable to scientific diagnostic tests and cell-phone snapshots as avant-garde issues in art and culture, and she makes a fine argument for why this has nothing to do with Greenbergian medium specificity, where a photographer would have to pin down the essence of photography to make art, as—in Greenbergian terms—an abstract painter ideally channels the essence of paint onto the canvas surface. She makes other acutely astute observations, too, for instance noting that Hal Foster, David Bates, and David Greene with Joanna Lowry have all written responses to contemporary subjective photography (such as personal and self-referential images by Nan Goldin and Ryan McGinley) that, “move photography away from postmodern critiques of representation, yet none of them wants to describe what is happening as a move backwards into tropes of modernism.” Ostensibly, she sees room for improvement. She guides us away from the anemic compromises to be made with terms like the art-of-photography or the artist-who-makes-photography. She delivers a book full of examples to bolster the cause for critical discussion about Art Photography—though, surprisingly, she doesn’t title upper-case her cause. But Soutter is not dogmatic; she is didactic. This book is not about living, being, and breathing as an artist. This book is a guide for how to behave in front of art. It’s a cheat sheet to memorize when faced with the expectations of academia and the institution. (I take this in and become short of breath:) “This is an insider’s guide, designed to empower readers to develop their own opinions about what is happening on the cutting edge of contemporary photography.” (WAP 1) I realize Soutter finds it to be of the utmost importance that you have done your homework before you make a photograph, or talk about one, but I don’t see room for my own opinion, and I’m resisting. It’s like when you go to a Tony Robbins “Unleash the Power Within” conference and expect to make your way quietly to your seat, to focus on your own notes and observe the spectacle, and then you realize you can’t. The enthusiastic ushers make you high five them with laser-like force. Your seat mates want to chat you up immediately. And they make you dance… Tony Robbins makes you dance…. (Not quite a good analogy. I haven’t been to an “Unleash the Power Within” conference, but I’ve read things… I’m having a hard time coming up with an analogy because, of course, everything I can think of is a stereotype, something trite, clichéd, and unfair in its narrowness.) How about this? It’s like knowing when you enter a library you should be quiet. Or, no—it’s like going to a church and knowing to stand when you sing the hymns. But, no—really, it’s like knowing that you are supposed to put the salad fork on the outside of your dinner fork on the left side of your plate. It’s manners. It’s the “insiders guide”-quality of this book that feels like an ill-fitting suit. I fell in love with photography looking at a late-18th-century photograph of a bare-branched tree. The texture of the albumen print, the shallow depth of field, this ancient and towering tree—this image put me right there to the extent that I could smell the mouldering leaves on the ground and the crispness of the Fall air. I consumed that image without looking at the ingredients and it consumed me right back. That love evolved into an abyss of curiosity about all kinds of photography. I like certain photo works and I don’t-so-much like others. I want to discover why I gravitate one way or the other. I appreciate the information, but Soutter’s disclosures might only get in the way. My heart sinks when I read this passage: “one of the reasons I wrote this book was to provide answers for photography students who regard themselves as artists. Again and again I have encountered the same questions: ‘If contemporary photography is so eclectic, why can’t I do what I like?’ ‘Why does it seem like my teachers want me to repress my creativity and to feel so guilty about visual pleasure?’ ‘Why can’t I work the way photographers did in the past?’ ‘Why is my work required to have a critical rationale?’” The truth is, I don’t much like eclecticism for the sake of eclecticism, sentimental beauty shots, or derivative works, and I think artists who can vocalize their critical rationale for their work are pretty clever folk. But if Soutter is being asked these questions at all, it seems to me that she and her colleagues are failing their students—rather than exciting them about the potentials of photography, perhaps Soutter and the academics are overestimating contemporary bias and undermining the students’ willingness to explore and make aesthetic judgments of their own. Soutter dispenses a lot of ideas in Why Art Photography?—and ironically, these ideas dictate that it is neither her ideas, nor yours, per se, that take precedence when you encounter a photograph, or have the urge to make one, but what everyone else—that ever-elusive bunch—is thinking in terms of art. Knowing this, perhaps Soutter hopes you will build a solid and admirable strategy to navigate this temperament that exists (almost a priori) out there in the world. You are meant to follow this certain temperament to get ahead (is that it? Does one get ahead by being on the “right” side?) and don’t forget that there are others out there who feel the other way about it (god bless their sorry souls—they didn’t get the memo. Watch out for that team…). There’s always something at stake, always something in crisis, always something to be won or lost. Or are we just bored? * Other examples of exhibitions and a symposium on this topic would be: What is a Photograph? was a recent exhibition at the International Center for Photography of contemporary photographers that pushed the limits of the medium in a post-Conceptual-art world. The associatively-precarious Anxiety of Photography was an exhibition at the Aspen Art Museum in 2011 that explored the power of photography’s “in-between” status as a medium after Conceptual art. “Is Photography Over?” was a two-day symposium at the San Francisco Museum of Modern Art in 2010 that did not necessarily answer its own question—perhaps for a good reason. Cover and interior images from Why Art Photography?